Using the company’s trademark mix of verbatim, movement and storytelling, Others is a piece about women, and the ill-informed assumptions we make about those around us. The Iranian theatre-maker speaks with eloquence of pride in her culture, and the company use her letter to highlight how little we really know about the women of Iran. This is the highlight of the show – the language is beautiful and the movement sequence, as the girls spill out their various inaccurate perceptions of Iranian culture, walks the line between comedy and pathos with ease. The prisoner speaks eagerly about her life, though the more she speaks, the more heartbreaking her story becomes. And then there is the celebrity. Our celebrity never speaks – she is noticeable in her lack of response to the company’s letters, and it is this that the company use to tell her story. The movement and use of poetic language in this piece is captivating, and there is a subtlety to the piece that is quite refreshing. I enjoyed the way it engaged the audience, and encouraged them to make their own minds up about these women. I should explain that I saw this piece based solely on my regard for the company – I watched In a Thousand Pieces with tears rolling down my cheeks, and hoped for a similar experience in Others. Unfortunately, Others did not impress me quite as much as their previous offering, and I was left feeling as though the piece lacked coherence. There seemed to be an attempt at deeper themes of perception, but this was not explored enough to be fully understood by an audience. The assertion that the Iranian theatre-maker was not their ‘Other’ suggests there was an attempt to find their equivalent in another woman, but this is an idea that is brushed away as quickly as it arrives. It feels a little like a wasted opportunity, as the theme we are left with, that we should cast judgement on those around us just because of their circumstances, is a somewhat muddy one considering the amount of themes and ideas that have been thrown at us. Though the production is flawed,, I still enjoyed its gentle nature – and loved the way this company really seems to have carved out a signature style for themselves. Their fluidity as a group is intriguing, and I would like to see another of their pieces, as I really think this company has something relevant to say. Walking into the Olivier Theatre we were greeted by a sonorous bell clanging harshly above us – on stage, a circular womb moved slowly around the revolve, something unseen shifting slowly inside. Above us, hundreds of light bulbs gently pulsed, growing brighter and dimmer in a gentle rhythm. This is the world Danny Boyle has created, and it’s immediately compelling. 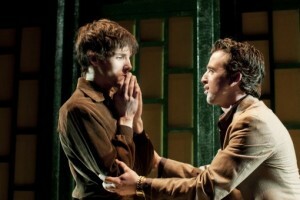 Jonny Lee Millers performance as the Creature is a revelation. His painful entry into the world is nothing short of astonishing as he bursts, completely naked, from his vertical ‘womb’. The following 15 minutes is simply the Creature learning how to use his newfound body. His spastic convulsions, leading slowly to his first, joyous, stuttering steps is incredible to watch. The childlike laugh as he walks proudly around the stage for the first time was replicated by many audience members. We were with him by that point – we saw his innocence, and his childish glee at the beauty of the world around him, and almost dreaded what was to come. I was in the rare position for this show, coming to the show with next to no knowledge of the plot. It was a blind spot I can’t explain – all I knew of Frankenstein was the very basics. Mad doctor creates a monster from spare body parts. I had no idea the story would pack such a punch. Nick Dear’s adaptation of Mary Shelley’s story has come under scrutiny in other reviews, with many seeing it as too schmalzy – I agree to a point (the “what is love?” question did make me wince), but overall I found this script intelligent, witty and humane. My only criticism is that the eponymous Frankenstein wasn’t in it nearly enough. The decision to pursue perfection in the Bride is fascinating, and made me miss the initial creation of the Creature; more focus on Frankenstein’s god complex wouldn’t have been out of place. As it is, the script suggested that the creature could have represented all that was good in the Doctor, but circumstance warped him into a cruel misrepresentation. Boyle and Dear appear to constantly pose a question to the audience – who is the real monster? The disfigured, frightening creature, or Doctor Frankenstein, who forgoes love and life in favour of creating perfection, or perhaps it is the society that shuns the Creature. The issue is not really resolved – though by the end it doesn’t matter. 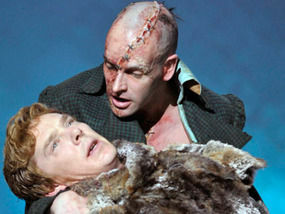 Boyle created a ‘shiver down the spine’ moment to close on, as the monster, now fully in control of his patched-together body, marches proudly into the snowy wasteland, while Frankenstein, physically and mentally exhausted, crawls slowly behind, chasing him to the bitter end. It is a wonderful change of fortunes, and one that stays with you long after leaving the theatre. After a successful run in the West End in 2007, David Grindley has revived his Olivier-nominated, Tony and Drama Desk award winning production production of Journey’s End for a 9 month UK tour. Written by R.C. Sherriff in 1928, Journey’s End is an honest and heartbreaking story of life in the trenches based on Sherriff’s own experiences during the First World War. The story follows the young officer Raleigh, newly arrived on the front line in the days leading up to the last great German offensive of the First World War. Eager to please his fellow officers and new comrades, he meets Osborne, Hibbert, and his childhood friend and hero Stanhope. After three years on the front, and having lost everyone he knew during that time, Stanhope is teetering on the edge of a breakdown. This production was impeccable. The set and lighting allow the audience to be sucked into what life was like for these men. The one room we saw was kitted out to the exact dimensions of an officers trench, while the lighting was dim, flickering, and gloomy. The sound, something so easily ignored under normal circumstances, provided moments of theatrical wonder as we heard the dull thud of bombs above us, followed by the distant patter of gunfire. This constant but distant presence was an incredible feat, and meant the louder more dramatic moments came as even more of a shock. The acting was the real star of the show here. R C Sherriff has created a fascinating dynamic between the characters, brought vividly to life by this incredible cast. I could go into detail about each performance in this show, but there is little point. Suffice to say that each member of the cast gives an incredible performance. Truly incredible. The juxtaposition of comedy and tragedy is as gripping as it is realistic, and there isn’t a single weak link in the cast, however there were two stand outs. Dominic Mafham’s Osborne is portrayed with quiet dignity, and provides moments of wonderful pathos – most notably when speaking with Stanhope in the hours leading up to suicidal raid on the enemy trench. Even in this, the moment of is inevitable death, his main thoughts lie with his new comrade, the 18 year old Raleigh “There’s no need to tell him, it’s murder.” he says almost genially. It sends a shiver down the spine. I cannot talk about this show, however, without singling out James Norton. His Captain Stanhope teeters on the brink of sanity in a way I just hadn’t imagined when reading the play (something I have done many, many times.) Clinging to the vaguest sense of himself, Stanhope struggles with his demons with a quiet intensity that is almost painful to watch. The whiskey he drinks is now the only thing that makes his existence tolerable, and as he tries desperately to appear unaffected to his comrades, we see heartbreaking moments of revelation as Stanhope cannot help but show how much three years of war has affected him. It is a stunning and beautiful performance, and one that will stay with me for a very long time. Those who know the script will know the heart-breaking and tragic end to this play, but David Grindley’s vision gives the final scene a raw intensity that will leave audience members stunned. I have never experienced leaving a theatre, with six-hundred people around me, in complete silence, every person stunned and awed by what they had seen. 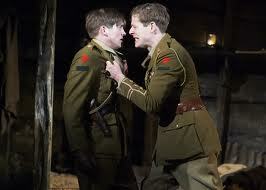 The script is still as relevant as it ever was and, sadly, still has a valid message about the futility of war. If you only see one production this year, make it this one.